It's already Wednesday? I started cleaning the attic. Too many papers in boxes. Too much stuff. Too cluttered to work. I've a giant bag of recycling and more to go through. I put some of the fleece away. Not going to get to it. I wanted to send it to a processor but cash is going to be short this winter. Etsy sales have tanked since they redid their search algorithm. My etsy sales covered the family's food budget. It hit me unexpectedly. Time to find a budget work around. There are still a few sales but an order of magnitude less. Business is very unpredictable. Next year inflation will hit. Uncertainty due to tariffs and lousy trade deals are starting to affect my business. I thought I was in control. Boy, was that an illusion! I guess, expect the unexpected. My crystal ball needs glasses but her healthcare didn't cover it. Maybe I'll find a new crystal as I clean the attic. Think I need one. I've been taking suggestions. I could offer a yarn club but haven't figured out how to do that on Etsy. Buy one skein a month and get a thirteenth skein free, something like that. First, I need to find out from the mill how much yarn is going up next year. They are saying some yarns have doubled in price but I don't know which yarns yet. So much is changing. It's hard to keep up. I'm not used to such a rapidly changing business landscape. Give me a bit to figure it out. The first week in January I should know more. Your suggestions are welcome. The attic has a lot of abandoned projects in it. Time to work on finishing those. This is within my control. 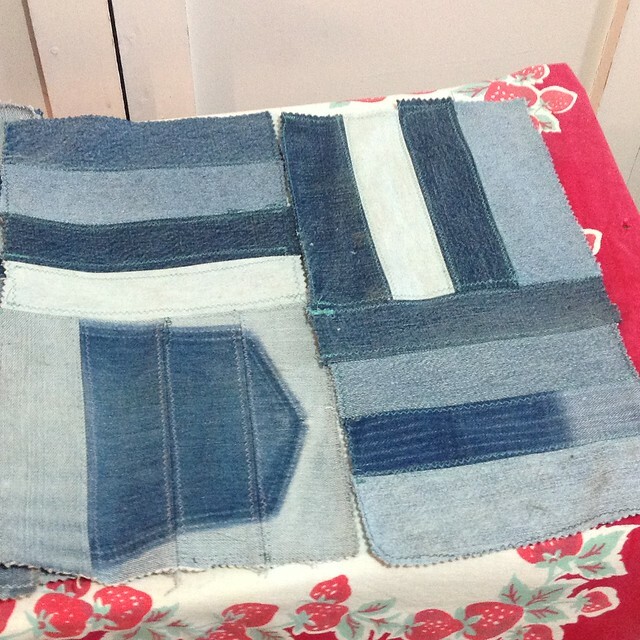 I found some quilts and piecework projects I started long ago. I'm starting with a quilt. I need to make 80 of these squares. I've 16 made so far. The cat and I head up every morning before the household wakes up. I don't have a serger but zigzag works. I'm looking forward to seeing a completed quilt. I've an old blue acrylic blanket. I think that'll be the backing. A simple tie-type quilt should do. The rectangle measurements were based on an old Clinique box for face cleanser. So not exactly round numbers, but it made a great template. I have a lot of random spools of thread kicking around. So many people destashed sewing gear as their eyesight deteriorated with age. Before my sight goes, this is getting done. Free thread is a plus. I'm using the Kenmore because the Pfaff needs a new belt. Night and day. The Kenmore is so clunky compared to the precision of the Pfaff. I mean it works, but the feeder dogs don't do as good a job. The thread tension could use one more guide to steer it. The stitches per inch are longer. So many corners were cut from an engineering perspective. Maybe it was just 1970 instead of 1950. Expectations were different. It's not as much fun to use. But then I do prefer a stick shift to an automatic too. Maybe I'm just a snob? Follow along with my sewing progress. There is garb to make and mundane clothes too. 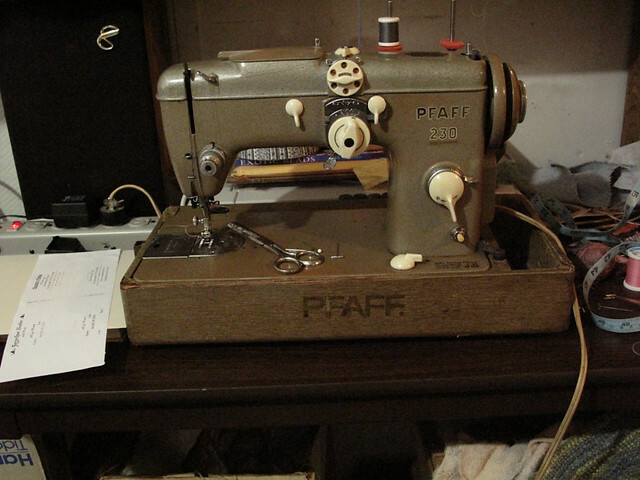 With this much sewing, I have inquiries to make too on a new belt for the Pfaff. Hopefully my repair guy is still in business. Wish me luck!